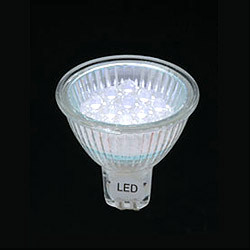 Made up of nine white fish; Vlike super bright LED bulbs; used in various vehicles as fog light or illumination light. 1. Part NO: MR16-9FISH-W. (1) Emitting color: super white. (2) Forward voltage unit (V): 13.2. (3) Totality luminous intensity unit (LM): 12.6. (4) Single LED axial intensity unit (mcd): 1200. (5) Dominant wavelength unit (nm): X: 0.29 Y: 0.28. (6) Viewing angle unit (deg): 65. (7) Color temperature unit (K˚): 8800. 2. Part NO: test condition power. (1) Emitting color: power: 1.18W. (2) Forward voltage unit (V): current: 90mA. (3) Totality luminous intensity unit (LM): Current: 90mA. (4) Single LED axial intensity unit (mcd): IF=20mA. (5) Dominant wavelength unit (nm): IF=20mA. (6) Viewing angle unit (deg): IF=20mA. (7) Color temperature unit (K˚): IF=20mA. (IR max: 0.01mA; VR=5V).